Includes Respite New Year's eve through midnight!!! A collection of experiences designed to give every guest the vacation they're looking for. 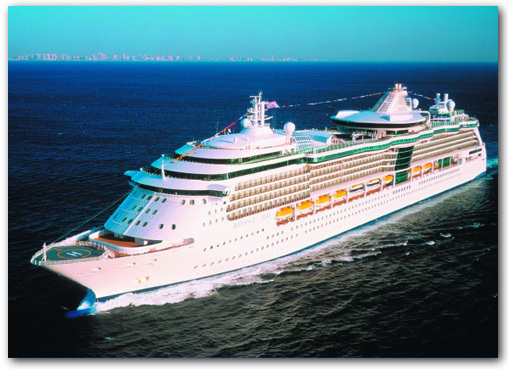 That's Navigator of the Seas, a ship built for adventure, relaxation, and everything in between. There's now even more to enjoy onboard including new shopping experiences and a revitalized Casino Royale! Plus signature favorites are still onboard. Climb a rock wall that overlooks the sea, or challenge yourself on the basketball court,ice-skating rink or mini-golf course. Achieve perfect zen, poolside or at the relaxing Vitality Spa. Liven up your nights on the Royal Promenade, with parades, dancing, and now more duty-free shopping deals. And bring along some friends - with new shops, spacious public areas, enhanced staterooms, and a spectacular three-story dining room. Explore Nassau, Bahamas - the capital of the Commonwealth - where endless tropical delights welcome you with a unique British colonial charm. 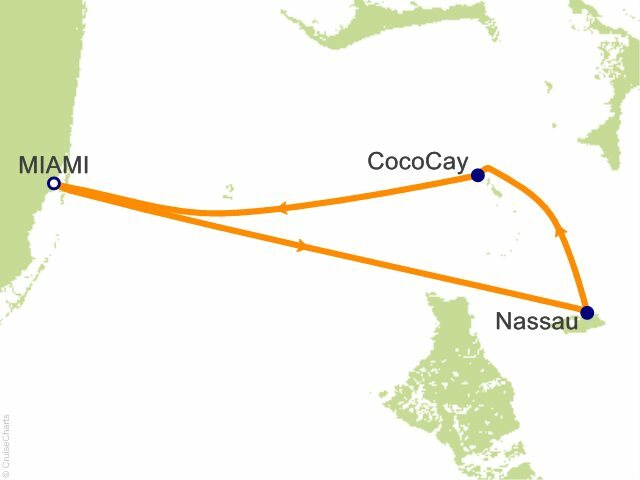 In the 17th century, pirates - including the infamous Blackbeard - dominated the territory, before civilization was restored in the 1700s and Nassau began to prosper. Now you can visit a wonderful island with outstanding shops, exciting casinos, unbelievable beaches - and evidence throughout the city of its storied past. Surrounded by the gentle, translucent waters of the Bahamas chain lies the secluded island of CocoCay. 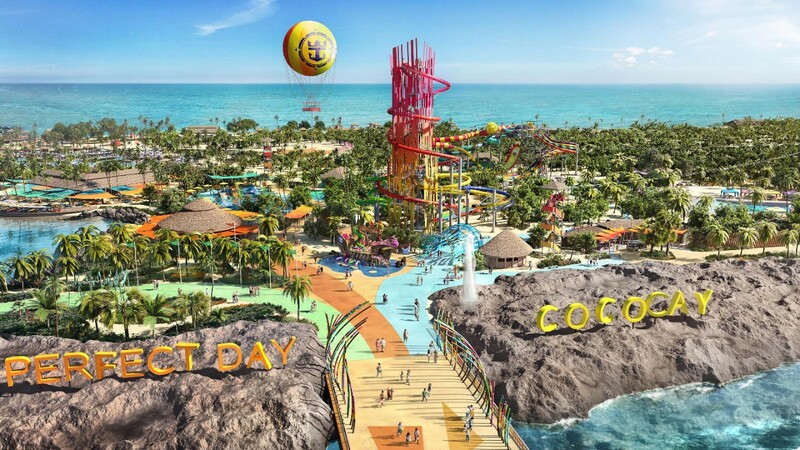 With its white-sand beaches and spectacular surroundings, CocoCay is a wonderland of adventure. Reserved exclusively for Royal Caribbean guests, this tropical paradise has recently been updated with new aquatic facilities, nature trails and a ton of great places to just sit back, relax and enjoy a tropical drink. Connecting cabins are available that sleep up to 8. - Prices in U.S. Dollars, may not be current as they change by cruise lines without notice. Cabins are booked based on double occupancy. - Comprehensive trip cancellation and travel protection insurance is available and may be quoted at any time. - We will contact you to review pricing prior to any payments. Extended Family & Friends - Our Staffed Cruises are open to all Extended Family and Friends (or families/individuals traveling without a child with special needs). Simply call us, use the Booking Form below, or use the Cruise Transfer Form (if already booked). Our forms allow you to designate the Guest Type. Enter a Cabin Category for Cabin "1"
Enter category Quoted, or from above. We will contact you to review pricing and specific cabin availability/location. Leave blank if not sure. # of Passengers for Cabin "1"
Enter a Cabin Category for Cabin "2"
# of Passengers for Cabin "2"
Enter a Cabin Category for Cabin "3"
# of Passengers for Cabin "3"
Enter a Cabin Category for Cabin "4"
# of Passengers for Cabin "4"
Each Passenger's First & Last name MUST be exactly as it appears on their identification. The Majority of our Professional Volunteers are female. Do you REQUIRE a Male during Respite or are Female Staff sufficient? A more detailed questionnaire will be sent closer to cruise date to collect special needs and dietary information. Please list any other Guests, even if not booked through AotS. How did you learn about Autism on the Seas? You will be credited appropriately on your Invoice. Cruise Line Cancellation Fees begin after the Final Payment Date, see cruise line website, or contact us for more details. AotS does not charge Cancellation Fees. You will receive an email confirming your booking request shortly after submission. We will contact you to confirm cabin choices and pricing. You will receive an Invoice via email after your payment clears, which will include cruise information and any balances due. Check payments will delay confirmations, which will delay receipt of your Paid Invoice. IMPORTANT - To receive a quote or pricing for your reservation for any CRUISE LINE PROMO, this form must be submitted by 5:00pm of the day prior to the Promo ending.